We’re off again with another great sporting event at the Roland-Garros tournament. 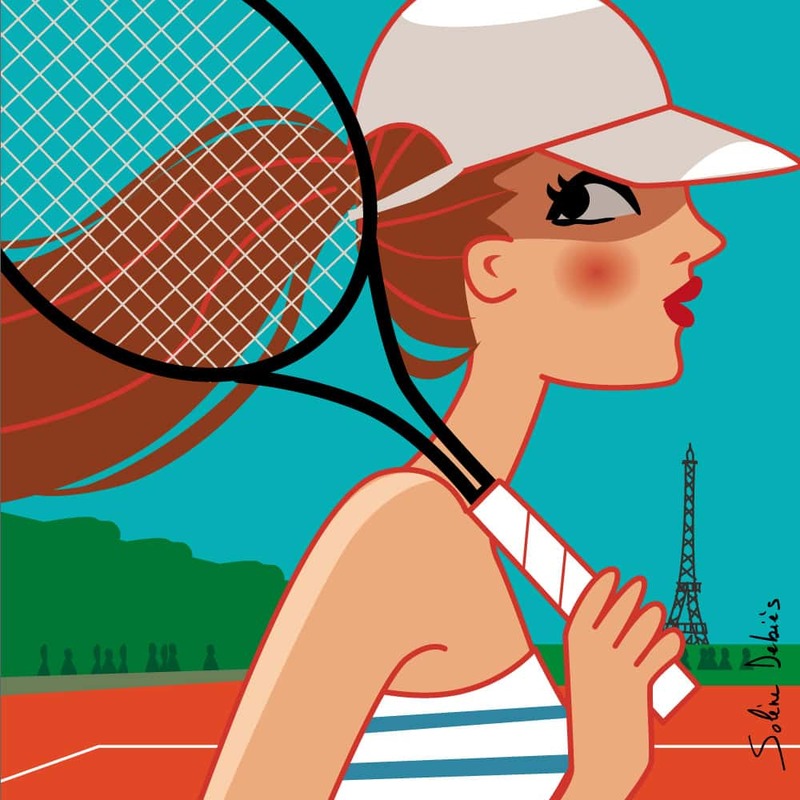 This event, which has made spring time a lot more rhythmic these past few decades, inspired me to do this sporty illustration of a charming Tennis Woman on the Parisian tennis courts. I played tennis for about 10 years, and I was interested in big events such as Roland Garros or Wimbledon. Watching players pace a court with a racket to raise a ball over the net, may seem a bit primitive as visual pleasure. But I assure you that high level tennis can become a captivating art show! I stopped tennis a long time ago … I no longer had the opportunity to put enough time and effort into it. I practiced classical dance a lot when I was a child, I really loved it, I wanted to become a dancer before choosing to become a professional illustrator! As an adult I continued to dance and took Salsa and Tango classes. I love the songs and it’s a real pleasure when I get to dance to them. I try to stay supple enough, so I take stretching classes once a week. I also do 10 minutes of stretching and gymnastics every day. It feels good and it’s good for your health! These regular habits maintain the taste for movement that I acquired with dance, but also with Yoga classes. And yes … My mother was a Yoga teacher! So the sequences, saluting to the sun and the folklore that follows, I know of too well! I have also illustrated a lot of postures and Yoga sequences. It’s a great way to practice drawing characters in movement. But now I prefer to walk in the countryside or in the city when I want to relax and breathe. I recently repaired my old bike, which is slowly getting back into service. Both my daughters practice a combat sport which is both graceful and very sporty, one that I love: The Capoiera. You learn to attack and dodge but whilst being graceful and light on your feet. We had studied all combat sports: Karate, Judo, Kung-Fu and boxing. It’s not easy to get into a boxing lesson, when you’re 7 years old. It’s truly impressive. Capoeira is a lot like dancing. It’s very beautiful, very aesthetic, but you learn to kick someone in the nose. When you’re a girl, it could come in handy! They love it. 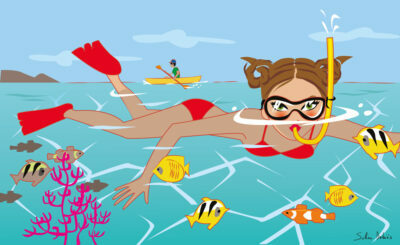 We also practice several sports with the family during our trips: First off, scuba diving, sometimes Marc has an air bottle, but most of the time, it’s just snorkelling. We also like to go off trekking or hiking, on foot or on horseback depending on where we are. We also tried surfing and bodyboarding off the waves in Sri Lanka, but we didn’t get very far on the surfing front … However, we were lucky enough to attend an international championship in Panama. We think this sport is wonderful. We came home with our minds full of beautiful memories, but also photos and of course some pictures! Sport is very important for billions of men and women. Major team games such as football, rugby or basketball are thrilling! For me personally, I think that the multitude of amateur practices such as (swimming, walking, running or cycling) allow these billions of spectators to regularly enjoy the effort and pleasure of sport. As part of my job as an illustrator, I have drawn quite a few sporty scenes, especially for the motion design film « Les maisons de Katy et Jacques ». I had to show the different activities offered to the families welcomed as part of a new holiday concept: golf, skiing, horse riding, swimming (most houses are of course equipped with a swimming pool! 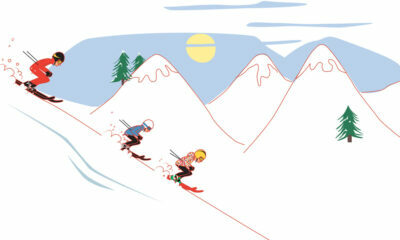 ), Not to mention all “natural” and cultural activities such as trekking or scooter riding! 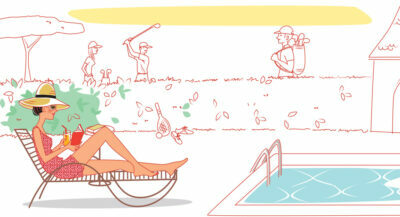 I intend to continue to draw inspiration from the beauty of athletes and sport for my illustrations. Sport evokes beauty, flexibility and the power of the human body, but also a certain pleasure and a form of art of living that is good and that unites millions of people. Anyway, what do you think about the woman with her tennis racket? Do you like her?